"These taste just like the Panera Bread® chocolate duet cookies! They're even better the second day. Enjoy!" Beat butter, white sugar, and brown sugar together with an electric mixer in a large bowl until smooth and creamy. Beat 1 egg into butter mixture; beat remaining egg and vanilla extract into butter mixture. Stir flour, cocoa powder, baking soda, and salt together in a bowl; add to creamed butter mixture and beat until the dry ingredients are integrated into a dough. Fold walnuts, white chocolate chips, and semisweet chocolate chips into the dough. Drop dough by teaspoonful onto baking sheets. Bake in preheated oven until browning along the edges, 9 to 12 minutes. For my own personal touch, I used walnuts plus chopped macadamia nuts, lightly toasted. Just add as many or as little as you want. I also used a 50mm cookie scoop and got approximately 40 cookies out of the batch. Chocolate lovers dream cookie!! 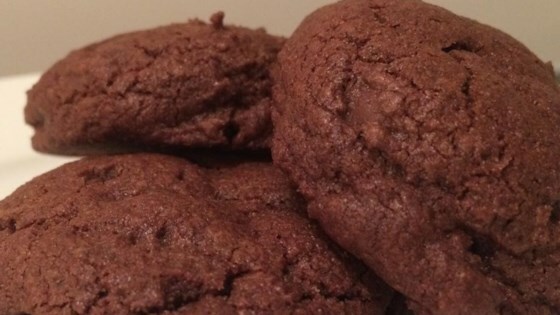 I added an extra 1/4 cup of Cocoa;-) These puffy but rich cookies are to die for!!! I added a cup of dark melted chocolate! They were great! Make sure you use DARK cocoa powder for this recipe. It makes for a much richer cookie in appearance and taste. I used Hershey's cocoa special dark.